Recently the internet and news world had a storm of debates and criticisms following a Guardian article that Saudi Arab's Grand Mufti labelled chess as forbidden in Islam. Naturally being a chess player and promoter of the game as well as being a Sunni Muslim - it was of utmost importance to me to dig a little bit into it. Some of my friends first pointed to me it in the Facebook and I immediately saw people's shock at such news. But I couldn't remember any Quranic verse (the holy scripture for Muslims) or any Hadith (guidelines from Prophet Muhammad PBUH) related to any board game. So I understood it as an Ijtihad of Saudi Mufti's own. Islam is not like Christianity where what the Pope says is the rules. Any such Ijtihad or Fiqh issue, we as Muslims, are open to interpret our own way with the guidance of Quran and Sunnah. So I was happy enough that it doesn't matter what the Saudi Mufti decreed 2 years back in a question answer session in a TV channel. Let's just move on. But then one of my friends pointed me to authentic Sahi Muslim Hadith that clearly forbids playing with dice. Yes, dice is not chess - but please keep reading the Hadith and the explanations I gave later. So clearly our Prophet Muhmmad (pbuh) forbade something about a game and told his companions to avoid that. As per the Science of Hadith - that saying being narrated by different people, will be different unique Hadith. Because a Hadith is a combination of the content (or the message) and the chain or narrators (Isnad). So if the same saying is narrated by 3 different companions of Prophet (pbuh) - that saying is actually 3 different Hadith. If you notice the wordings of the above Hadith, the translators of the Hadith have already differed on what is actually forbidden - Dice, Backgammon or Chess. In the Bengali translation they went one step ahead and mentioned both Shatranj and Chess in an OR condition, making sure both are considered as forbidden. Which one you think is actually forbidden? Well it can not be chess and its most probably about any (or a particular) board game that is played with dice. Why do I think so? Because Chess, as we know was not even invented at 6th or 7th century at the time of Prophet Muhmmad (pbuh). First Chaturanga was invented in India sometime in 6th Century (I read an article that claims it to be to be 570 AD in which case it coincides with the birth year of Prophet PBUH). Muslims scholars took it to Arabia, then Persia where it got the name Shatranj in 7th Century. 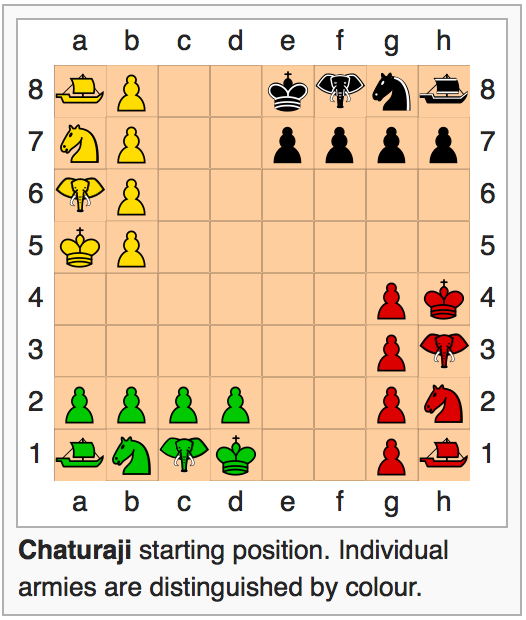 We can assume Chaturanga and Shatranj are practically the same game although there must have been minor differences in rules. 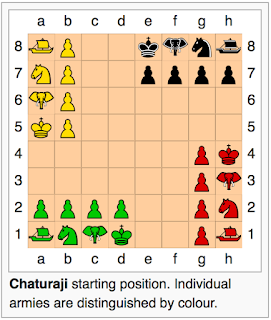 Because in scholarly works and in wikipedia these 2 games are always mentioned side by side but separately indicating which tells me that Shatranj itself evolved a bit from Chaturanga. From Chaturanga a game that is played with dice named Chaturaji (picture given below) might have evolved as we see evidence of this game in a writing at 1030 AD. This was a 4 player chess like game that was also played with dice. Chess as we know today has evolved lot of centuries later from Chaturanga or Shatranj. The pieces took on their current powers in Spain in the late 15th century; the rules were finally standardized in the 19th century. So anyone who says he played chess before 15th Century - they are talking about a different game, not chess. Also from Shatranj evolved several other games pnotably Xiangqi (i.e Chinese Chess) and Shogi (i.e. Japanese Chess), Janggi (i.e. Korean Chess) and Makruk (i.e. Thai Chess. Imam Malik RA said that it is worse than the game of nard (backgammon, which is also haram) and more destructive than gambling. 1. "Chess can be played with gambling." - My position is that, any game or activity in the world, can be played with gambling. Hence gambling is haraam, but not the game. Chess is a game where people mostly play without gambling. 2. "Chess is a waste of time and may delay you from prayers and other responsibilities" - well, that's true for any other games and activities. Hence nothing specific to chess. 3. "Chess introduces enmity between the players" - again, that's true for most of the games. So as long as you dont feel enmity against oyur opponent, you are okay playing chess. 4. One of the chess pieces, the knight, has the image/structure of a horse. That in itself has been subject to questions on whether Muslims can use these pieces to play with. Again I believe its a fiqh issue - not a clear cut yes/no. So I understand based on the above lights that playing chess is halal in Islam - neither forbidden nor rewarded, as long as we play it within decent manner.